This is the last one today. Sorry for spamming you with so many. The remaining five chapters will be posted here on dreamwidth or here on livejournal. Summary: Spike and Buffy have been turned into kid. The Scoobies have to figure out how to solve the mystery without them, while Buffy and Spike are stuck spending lots of time together much to her chagrin. This basically is a bit of fluff and hopefully will provide a few laughs. The story has ten chapters, but I will only be posting five today. If you like you can read the rest on mylivejournal because unfortunately I didn’t get around to finishing the whole thing on time. AN: I would like to dedicate this to the wonderful Ginar369, who provided a beta, and the talented Ladyaisha, who was my sounding board and conspirator. Any mistakes are my own. Disclaimer: How I wished I actually owned Buffy and Spike. Rating: PG-13; probably a few chapters will be R down the road. Summary: When unknown demons attack Spike in autumn 2019 and infect him with what seems to be a parasite, all Slayer and Watcher hands are on deck to try to get it out of him. But what if the “parasite” could be something more? A/N 1: This is, as you may be able to tell from the summary, an mpreg fic. Spike gets pregnant. If the concept of male pregnancy freaks you out, this is probably not the fic for you. A/N 2: This is a WIP. I expect it to be a good-sized novella when all is well and done. Sadly, I am quite far from being well and done, and all I have at the moment is Chapter 1 and maybe Chapter 2 later in the week, if I can get my act together. Writing (of any kind; not just this) has been like pulling teeth lately, but I am hopeful that this story at least will take off once I get past the introductory, what-the-hell-is-inside-of-Spike chapters. In any case, this is my first time posting a WIP (in BtVS fandom at least), and my apologies if updates take a while. Please feel free to friend me if mpreg is your cup of tea and you’d like to keep up with the fic. A/N 3: So not only is this a WIP, this is a WIP that takes place far in the future in my post-NFA verse, which I not at all ironically call the HEA-verse. In this verse Anya and Cordelia were resurrected by the PTB after NFA, the Scoobies moved back to the newly rebuilt (but no longer a Hellmouth) Sunnydale in mid-2005, and they all had children a few years later. 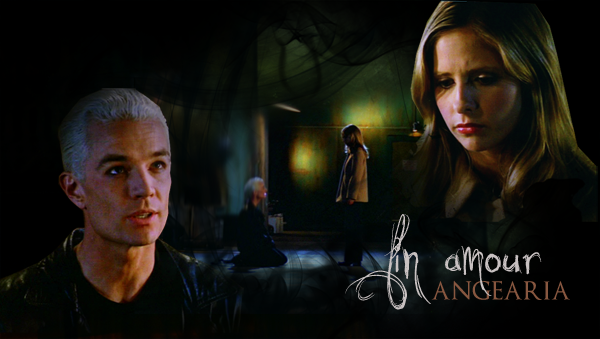 The pairings are Buffy/Spike, Xander/Anya, Willow/Oz, Cordelia/Angel, and Dawn/Gunn. A list of fics in this verse is on my fic masterlist if you’re interested, but below the cut is a brief description of original characters and other relevant information that will tell you all you need to know. A/N 4: Thank you again to the mods for everything you do! Lastly, this is for snickfic, who wields her great power of seducing people to mpreg with great responsibility. Thank you for the inspiration, Snick. Thanks to: quinara (as usual) for the title, and my betas: snickfic for (subtly! always subtly!) dropping “hints” that I needed to write her mpreg, for getting me to reign back on the internal dialogue, and (as usual) saying, “This really needs an actual arc” (someday I’ll learn how to do that without you telling me I need to! ); and angearia for help with Willow-speak and (as usual) writing better dialogue than I can–a good fourth of the dialogue is from her pen. Y’all are so good to me. Thank you! A/N: This is set in the same universe as Basiare and Infinitas Infinitio Infinitus. It’s not necessary that you read those two, but I think you’d like them! Also, I got started on this too late to give the idea as much of a story as it deserves. But I hope to eventually continue it, though it may be a while. So you can consider this a one-shot if you don’t read WIPs, or if you aren’t bothered by the idea, you can think of it as a prologue to a fic that may be continued at a future date. Cheers! Summary: The monks’ spell to create the Key goes wonky. Rating: R for (highlight to view) language, graphic violence and character death. Author’s Note: The beginning dialogue in the prologue is lifted from the BtVS episode No Place Like Homeand one line borrowed from Spiral—all the rest is my own. The title is French for “courtly love” or, to be more accurate, a “fine love”. This story is my feminist spin on a chivalric epic. The concept for this story was inspired by discussion with flake_sake where the question was raised: how can a story express a great and abiding romantic love without the sexual expression of love? Fin Amour is my answer.